MIT chemistry professor Yogesh Surendranath and three colleagues have found a way to use electricity, which could potentially come from renewable sources, to convert methane into derivatives of methanol. The researchers developed a low-temperature electrochemical process that would continuously replenish a catalyst material that can rapidly carry out the conversion. Scientists at MIT have developed a new way to harness wasted methane that could help curb needless “flaring” of potent greenhouse gas. Methane gas, a vast natural resource, is often disposed of through burning, but new research by scientists at MIT could make it easier to capture this gas for use as fuel or a chemical feedstock. Many oil wells burn off methane — the largest component of natural gas — in a process called flaring, which currently wastes 150 billion cubic meters of the gas each year and generates a staggering 400 million tons of carbon dioxide, making this process a significant contributor to global warming. Letting the gas escape unburned would lead to even greater environmental harm, however, because methane is an even more potent greenhouse gas than carbon dioxide is. Why is all this methane being wasted, when at the same time natural gas is touted as an important “bridge” fuel as the world steers away from fossil fuels, and is the centerpiece of the so-called shale-gas revolution? The answer, as the saying goes in the real estate business, is simple: location, location, location. The wells where methane is flared away are primarily being exploited for their petroleum; the methane is simply a byproduct. In places where it is convenient to do so, methane is captured and used to generate electrical power or produce chemicals. However, special equipment is needed to cool and pressurize methane gas, and special pressurized containers or pipelines are needed to transport it. In many places, such as offshore oil platforms or remote oil fields far from the needed infrastructure, that’s just not economically viable. But now, MIT chemistry professor Yogesh Surendranath and three colleagues have found a way to use electricity, which could potentially come from renewable sources, to convert methane into derivatives of methanol, a liquid that can be made into automotive fuel or used as a precursor to a variety of chemical products. This new method may allow for lower-cost methane conversion at remote sites. The findings, described in the journal ACS Central Science, could pave the way to making use of a significant methane supply that is otherwise totally wasted. “This finding opens the doors for a new paradigm of methane conversion chemistry,” says Jillian Dempsey, an assistant professor of chemistry at the University of North Carolina, who was not involved in this work. Existing industrial processes for converting methane to liquid intermediate chemical forms requires very high operating temperatures and large, capital-intensive equipment. Instead, the researchers have developed a low-temperature electrochemical process that would continuously replenish a catalyst material that can rapidly carry out the conversion. 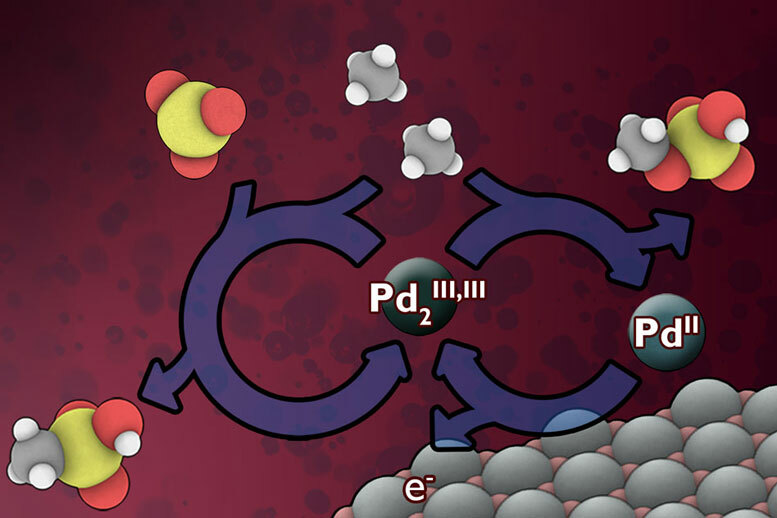 This technology could potentially lead to “a relatively low-cost, on-site addition to existing wellhead operations,” says Surendranath, who is the Paul M. Cook Career Development Assistant Professor in MIT’s Department of Chemistry. Already, he says, “methane is playing a key role as a transition fuel.” But the amount of this valuable fuel that is now just flared away, he says, “is pretty staggering.” That vast amount of wasted natural gas can even be seen in satellite images of the Earth at night, in areas such as the Bakken oil fields in North Dakota that light up as brightly as big metropolitan areas due to flaring. Based on World Bank estimates, global flaring of methane wastes an amount equivalent to approximately one-fifth of U.S. natural gas consumption. When that gas gets flared off rather than directly released, Surendranath says, “you’re reducing the environmental harm, but you’re also wasting the energy.” Finding a way to do methane conversion at sufficiently low cost to make it practical for remote sites “has been a grand challenge in chemistry for decades,” he says. What makes methane conversion so tough is that the carbon-hydrogen bonds in the methane molecule resist being broken, and at the same time there’s a risk of overdoing the reaction and ending up with a runaway process that destroys the desired end-product. The result of the reaction is a pair of liquid chemicals, methyl bisulfate and methanesulfonic acid, which can be further processed to make liquid methanol, a valuable chemical intermediate to fuels, plastics, and pharmaceuticals. The additional processing steps needed to make methanol remain very challenging and must be perfected before this technology can be implemented on an industrial scale. The researchers are actively refining their method to tackle these technological hurdles. “This work really stands out because it not only reports a new system for selective catalytic functionalization of methane to methanol precursors, but it includes detailed insight into how the system is able to carry out this selective chemistry. The mechanistic information will be instrumental in translating this exciting discovery into an industrial technology,” Dempsey says. The research team included postdoc Matthew O’Reilly and doctoral students Rebecca Soyoung Kim and Seokjoon Oh, all in MIT’s Department of Chemistry. The work was supported by the Italian energy company Eni S.p.A. through the MIT Energy Initiative. Be the first to comment on "MIT Develops a New Way to Harness Wasted Methane"